Offer Terms: Awarded as 200% Bingo Bonus (3 x wagering, 21 day expiry) 100% Casino Bonus (50 x wagering) upon successful first deposit. Opt in required. Min £10 deposit within 7 days of registration, max bonus available £150. Created by bingo lovers, for bingo lovers. Dream Bingo first appeared in 2007 and runs on the Microgaming platform, managed by Betway Limited. This enhanced software offers players flawless HD graphics and a fantastic, seamless website that is so simple to use. The processing power is so fast that players can even play two seperate games, at the same time. Dream Bingo’s number one priority is customer satisfaction. 2014 saw a huge overhaul to the site offering new games, promotions, prizes and theme! The site has a bright and colourful, almost funfair feel to it and everything is neatly placed and so easy to find! Although there are a small variety of slots and side games on offer too, the site is primarily dedicated to 75 and 90-ball games, keeping it classic, simple and mainly focussed on bingo. It’s a perfect choice for players who don’t enjoy being overwhelmed by too many gaming options. Dream Bingo not only offer great promotions and an incredible progressive jackpot, but players can also win some fantastic physical prizes too such as nutribullets, fitbits, kindles and more. The site is also very focussed on chat and community too. All rooms are designed to get players connected, making it a great place to form friendships with fellow daubers and also get involved in the social media world of Dream Bingo aswell. Players even have the opportunity to enter a competition, just enter your own dream and you could stand a chance of actually winning it. So if it’s a new car your’re after, simply fill in the form and “Dream” away. Dream Bingo offer some fantastic promotions which won’t be found anywhere else. The welcome offer is the perfect way to start your Dream Bingo experience. Simply click on the link at the top of the page for more details. Terms and conditions will apply, and all players must be aged 18 or over. There are lots of other promotions up for grabs too. Make sure you get online on the last Saturday of every month between 7pm and Midnight GMT for the new £10,000 Blowout. £5,000 goes to the winner and the remaining £5,000 is split between everyone else in the winning game. Fancy something a little different? Then head on over to the Immortal Romance bingo room. Dream Bingo have recently upped the chance of unlocking that jackpot wheel. Throughout the game, players must collect medallions for big cash prizes of up to £1,000 and at the moment, players will find at least 1 medallion in every strip of tickets bought. A variety of seasonal promotions are added and updated regularly throughout the year too, and with guaranteed wins of over £20,000 every month, there’s always something going down at Dream Bingo. The Dream Bingo site is operated on the Microgaming platform from Betway Limited. This company is registered in Malta. All of Dream Bingo’s games and slots are spread across just 5 bingo rooms. These are the Newbie, Friendship, Speed, Sapphire and Immortal Romance rooms. The Newbie room is for new players only and offers free Bingo for the first 5 days from registration. In the Friendship room, players can enjoy 90-ball Bingo 24/7, and really get their chat on. Got the need for speed? The Speed room offers quick fire games every hour from Midday – 10pm GMT, with more than £8,000 up for grabs each week. In the Sapphire room, players will find 75-ball bingo. Open every day from Midday – 6am GMT, players can win their share of up to £4,000 each week. There are also progressive jackpots here too including the Blackout Progressive. This has a guaranteed minimum of £500 attached. Finally head on over to the Immortal Romance room. This room is all about fun and adventure. Follow the forbidden love story with Amber, Troy, Michael and Sarah, and earn your medallions towards the jackpot wheel! Enter the crypt every night from 5pm – Midnight GMT. 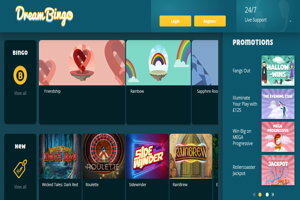 As mentioned before, the site is primarily focussed on its bingo offerings but players can find some slots and casino style games throughout the bingo rooms if wanted. 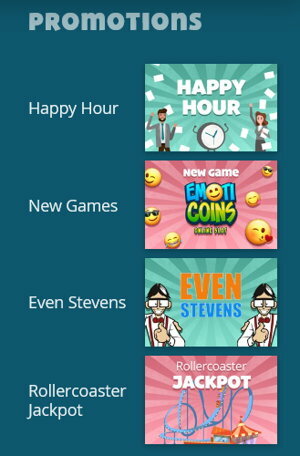 The collection is small but players can find popular slots such as Terminator 2 and Thunderstruck 2, and also various side games like Roulette, Poker, Jacks and craps. Please check all the terms and conditions on the Dream Bingo website as details and payment methods can change. Bingo wagering requirements are 3x bingo bonus. Casino wagering requirements are 50x casino bonus. Dream Bingo offers up a professional, colourful and easy to use platform, with fantastic games and promotions too. Although bingo rooms are limited to just 5, each room offers a plethora of games and activity, and there always plenty of bonuses, promotions and prizes to be won.